Everything the singer/rapper does is just spot on! Whether it is music, movies, skateboarding, social media, community building or fashion, mister Williams does it with flair. 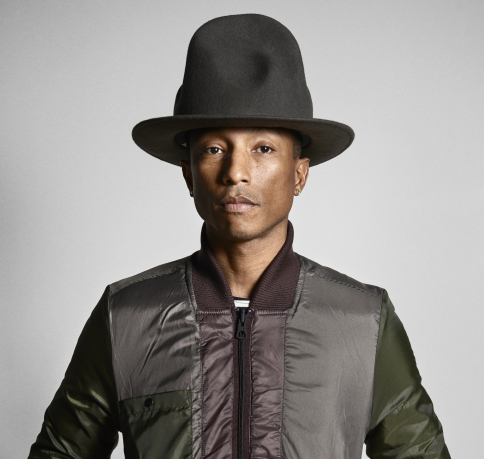 Over the last couple of weeks, the rapper made headlines with the Dudley Do-Right camel-colored Grammy hat. It became a celebrity on its own, and set cyber tongues to wagging with its own Instagram account and Twitter account that at last count had 19,000 followers!? Kanye West can talk about the leather jogging pants all he wants, but he just can’t do it like Pharrell. Remember when Williams hit the air with N.E.R.D. back in 2001 and introduced us to their skater/trucker style? They had everyone copying their look including the skinny jeans and key chains. What followed were two clothing lines, Billionaire Boys Club and Ice Cream Footwear, and a long list of collaborations with a.o. Louis Vuitton, Takashi Murakami, Moncler and Mark McNairy. So I was kinda hyped when it was announced that Pharrell Williams, Creative Director of Bionic Yarn, will be collaborating with Dutch powerhouse G-Star RAW for a project called “RAW for the Oceans’. The collaboration is a creative exploration, where Bionic Yarn and G-Star joined forces to innovate denim. Together they will create a collection made with recycled materials from the oceans in stores from August 2014. In addition to the joined seasonal collections, G-Star will integrate Bionic Yarn material into existing product lines. I’ll hit some images online as soon they can be published!